Johann Sebastian Bach was certainly one of the greatest musical geniuses of all time. Today’s Bach festivals, concerts, recordings and biographies testify to his immense worldwide popularity. Few realize, however, that Bach was firmly rooted in a musical tradition begun by Martin Luther two centuries earlier. In fact, Bach composed most of his music for Sunday morning church services. 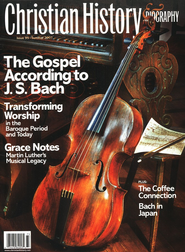 In this issue you will learn about Bach’s faith and its expression in his music, the early Lutheran music tradition from which he came, and how Bach’s music continues to proclaim the Christian story. Finally, you are invited to reflect on how we could incorporate Bach’s music into today’s worship services.